Roxie Munro is the author/illustrator of more than 40 nonfiction and concept books for children, many using “gamification” to encourage reading, learning, and engagement (including Mazescapes; Amazement Park; the Inside-Outside Books: New York City [New York Times Best Illustrated Award], Washington DC, Texas, London, Paris, and Libraries; Feathers, Flaps & Flops; Doors; Gargoyles, Girders & Glass Houses; Ranch; Wild West Trail Ride Maze; Circus; Mazeways: A to Z; Rodeo; Go!Go!Go! ; Inside-Outside Dinosaurs; and the KIWi Storybooks nonfiction series). Her books have been translated into French, Italian, Dutch, Chinese, and Japanese. Recent books: Market Maze (Kirkus Star), Slithery Snakes; EcoMazes: 12 Earth Adventures (Starred review in School Library Journal; Smithsonian’s Best Science Book for Children); Desert Days, Desert Nights; Hatch! (Outstanding Science Trade Book, NSTA and CBC; Society of International Librarians Honor Award; Bank St College Best Books of 2012, with Outstanding Merit); Busy Builders (Bank Street CCLL Cook Prize Honor for STEM), and a series of nine nonfiction giant and fold-out KIWi Jr. Storybooks. Roxie was born in Texas, and grew up in southern Maryland, by the Chesapeake Bay. At the age of six, she won first prize in a county-wide contest for a painting of a bowl of fruit. She has been a working artist all her life, for a while freelancing in Washington, D.C. as a television courtroom artist. It was great training for life drawing, concentration under pressure, and making deadlines. Clients included CBS, the Washington Post, and the Associated Press. Fourteen of her paintings have been published as covers of The New Yorker magazine. Many oils and watercolors are views from the roof of her sky-lighted loft studio in Long Island City, New York, just across the East River from her home in mid-Manhattan. Roxie is married to the Swedish writer/photographer, Bo Zaunders. 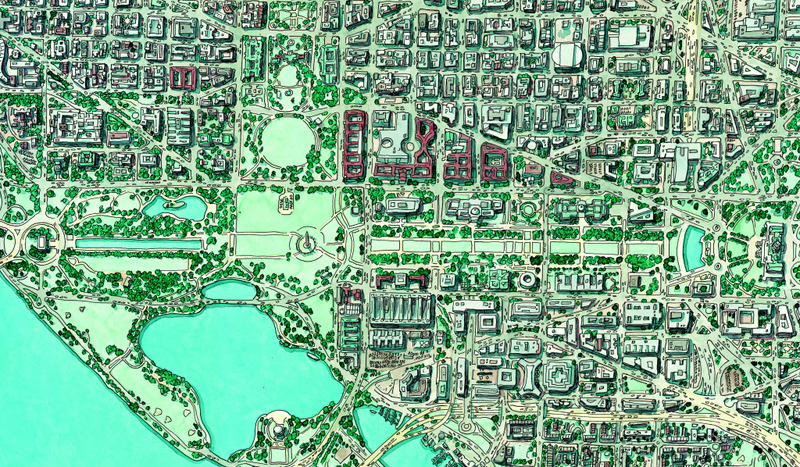 A note from Roxie: “I lived in Washington, D.C., from 1972 to 1981 (when I moved to New York City, right after the New Yorker magazine bought my first cover art). In 1985 I created The Inside-Outside Book of New York City. After the success of that book, I started the Inside-Outside series. The next one was The Inside-Outside Book of Washington D.C, to be published in 1987. “To research the Washington book, in 1986 I made thirteen trips down from New York to Washington on the train. Because of my earlier work as a television courtroom artist, I knew many journalists and had friends in newsrooms throughout the city. I was able to get special access to lots of places . . . the Library of Congress, television control rooms, the Washington Post newsroom and printing presses, the Supreme Court, the United States Congress, and the White House. Incidentally, the first freelance courtroom artist job I had, for the Associated Press, was the sentencing of Haldeman, Erlichman, Dean, and Mitchell—their involvement in the Watergate scandal helped bring down the Nixon Presidency. “On January 28, 1986, I was working in the Press Gallery of the Capitol Building, overlooking the floor of the Senate, sketching the beautiful huge ornate space for The Inside-Outside Book of Washington DC. Suddenly there was a bit of commotion behind me, as reporters jumped up and left the viewing area. Someone said, “The shuttle blew up!” I thought they meant the Washington, D.C.-New York airline shuttle. I returned to the Press Room, where everyone was staring in horror at the single (then!) television monitor placed up high on a wall. It was the Challenger explosion. A horrible and traumatic day. . . . 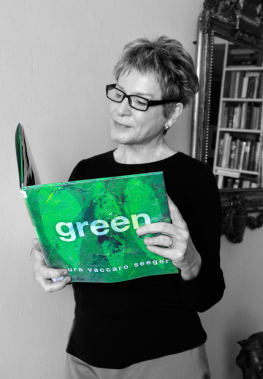 Author and artist Roxie Munro recommends Green (Roaring Brook Press, 2012), written and illustrated by Laura Vaccaro Seeger, as a Great Read for ages 2-6. Check out more Great Reads on thencbla.org.